NYSLRS, comprised of the Employees’ Retirement System (ERS) and Police and Fire Retirement System (PFRS), had 652,324 members as of March 31, 2017. Our members are State, local government and school district employees from across New York, including 617,143 in ERS and 35,181 in PFRS. Eighty-one percent of our members are active, which means they were on a public payroll as of March 31. As new public employees come on board and more Tier 3 and 4 members reach retirement age, Tier 6 is expected to represent the majority of NYSLRS members in a few years. 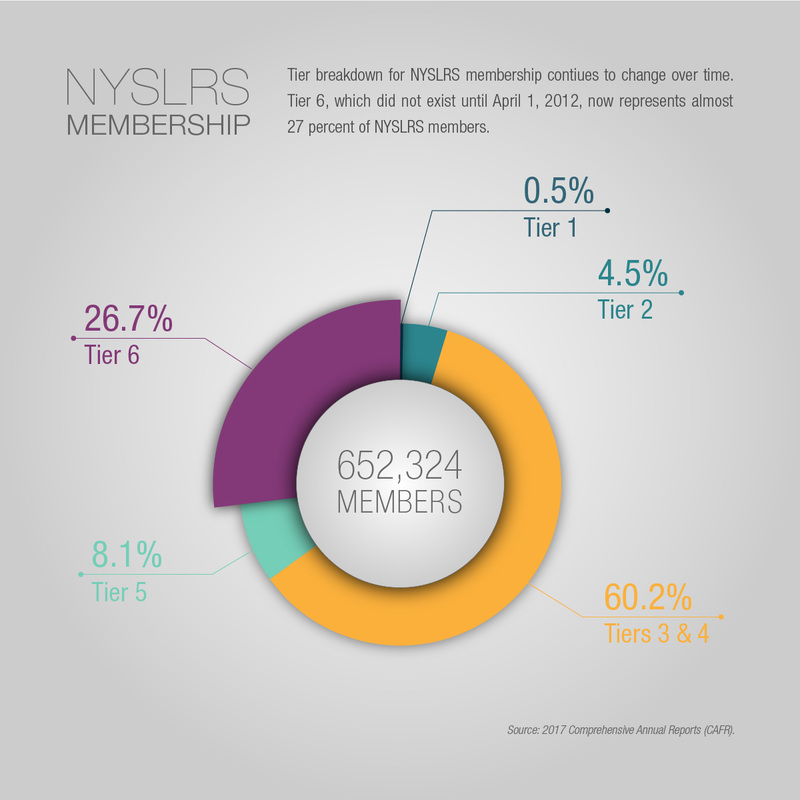 Tier 6 includes members who joined NYSLRS since April 1, 2012. In just five years, they’ve grown to more than 174,000 members, making up 26.7 percent of total membership. Tier 1: NYSLRS’ oldest tier, whose members first joined the system before July 1, 1973 (July 31 for PFRS members). Tier 1 now represents only one half of 1 percent of our membership. There are only 54 Tier 1 PFRS members remaining. Tier 2: With 29,186 members, Tier 2 represents 4.5 percent of membership. More than 87 percent of Tier 2 members are in PFRS. Tier 5: Tier 5 covers members who joined in a period of a little over two years (January 2010 through March 2012). With 53,118 members, Tier 5 now represents 8.1 percent of membership. Tier 6: This tier covers both ERS and PFRS members who joined since April 1, 2012. Its ranks have grown by nearly 29 percent over the past year. Content last revised October 11, 2017. This entry was posted in General News, Members and tagged ERS, ERS Tier 1, ERS Tier 2 New Career Plan, ERS Tier 3, ERS Tier 4, ERS Tier 6, Information is the Key, members, New York State & Local Retirement System, NYSLRS, One of America's Largest Pension Systems, PFRS, PFRS Tier 1, PFRS Tier 5, Tier 1, Tier 2, Tier 3, Tier 4, Tier 5, Tier 6 on October 11, 2017 by NYSLRS. But if the vote goes through in November – are tier 4 members going to lose their pensions? Every 20 years, a question appears on the ballot asking voters if there should be a convention to revise and amend the constitution. This question will be on the November 7, 2017, general election ballot. If voters approve the convention, delegates would be elected the following November, and the convention would begin in April 2019. Any constitutional changes proposed by the delegates must be approved by the voters in the following general election. Why has the Comptroller or the Legislature made no effort to equalize the benefit changed in 2002 when members stopped contributing after 10 years of service? At that time, I believe Tier 1 & 2 members were given extra service credit while Tier 3 & 4 members who had already contributed more than 10 years (some as many as 25 years or more) received no credit, no reimbursement or no compensation for the extra contributions they made. When will this inequity be fixed????? When the Legislature created Tier 3 in 1976 and Tier 4 in 1983, it provided that membership would be contributory. Subsequently, the Legislature approved a bill, which became Chapter 126 of the Laws of 2000, which eliminated contributions for Tier 3 and 4 members after ten years of credited service or ten years of membership on or after October 1, 2000. There was no provision in the legislation to refund contributions before that date. Since Tier 3 had been established in 1976, there are some members who had contributed for more than the 10 years. There has been legislation proposed since 2000 to either refund or provide additional benefits for those members who contributed for more than ten years. However, such legislation has not been enacted into law. I was a tier 3 member and contributed over 12 years into the retirement system. Tier 3’s should all let their voices be heard ! If you are a tier 3 member and paid into the retirement past 10 years , we are owed a refund plus accrued interest for the extra we paid into the retirement system.